This campaign letter from Republican candidate Paul R. Wunsch reminds state employees to vote for him in the August 4th primary election for Kansas Governor. 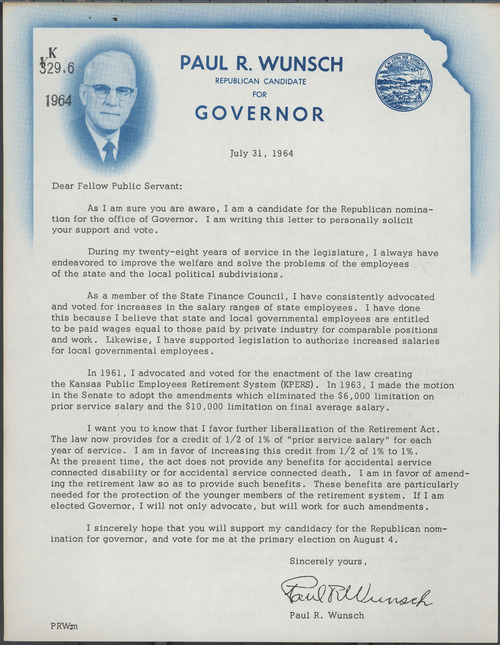 The letter goes on to state how he advocated, during his twenty-eight years of legislative service, for salary increases for state employees and his support for the Kansas Public Employees Retirement System. A yellow flyer is included with newspaper headlines from across the state endorsing his candidacy.